Ashtanga Yoga, which literally means eight-limbed yoga is a system outlined in the yoga sutras attributed to the ancient sage Patanjali. The sutras consist of eight limbs or requirements to achieve full self-realization. They are not practiced in order, but are all developed together as one progresses on the spiritual path. 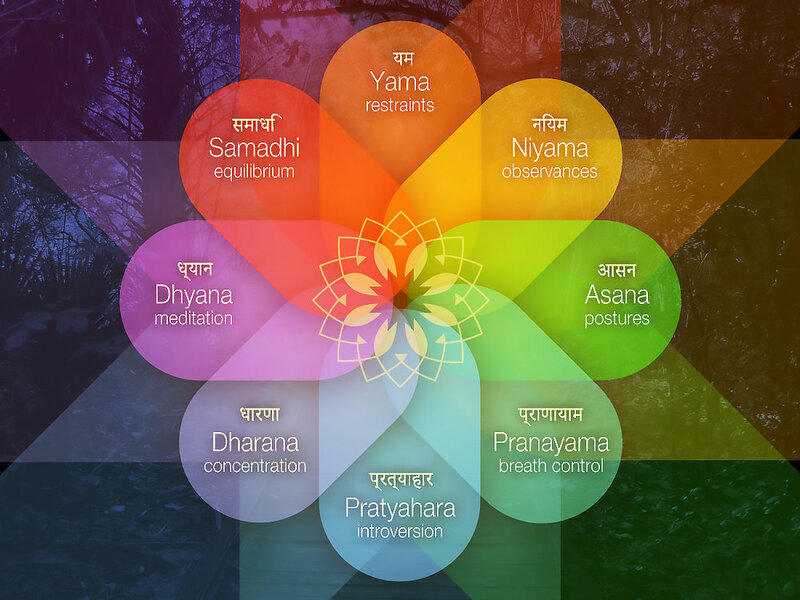 Meditation is one such technique that helps a spiritual practitioner to develop in these areas. "Ahimsa" — Sanskrit for "non-harming"
"Satya" — Sanskrit for "refraining from dishonesty"
"Asteya" — Sanskrit for "non-stealing"
"Brahmacharya" — Sanskrit for "wise use of sexual energy"
"Aparigraha" — Sanskrit for "non-possessiveness"
"Saucha" — Sanskrit for "purity"
"Santosha" — Sanskrit for "contentment"
"Tapas" — Sanskrit for "self-discipline"
"Svadhyaya" — Sanskrit for "self-study"
"Ishvara pranidhana" — Sanskrit for "surrender to a higher source"
Asana - Literally meaning "seat" or "sitting posture," asana (AHH-suh-nuh) refers to a body position used in a yoga practice. Through practicing asanas, you learn discipline and concentration which are necessary for the later limbs. Moving and stretching your body also helps you prepare for long periods of seated meditation. Pranayama - Pranayama (prah-nah-YAH-muh) can be translated as "restraint of the breath," it refers to more than simply holding your inhalations. In yoga, the life force energy is called "prana." Practicing pranayama includes yogic breath control and regulation techniques. These exercises are intended to manipulate the flow of prana in order to bring about steadiness of mind and changes in consciousness. Pratyahara - Literally meaning "withdrawal of the senses," pratyahara (praht-yah-HAHR-uh) is the practice of tuning out the distractions of the outside world. Focusing your mind inward allows you to detach from the trials and fluctuations of life and see their challenges in a new light. You can view your habits and patterns more objectively, becoming aware of things the way they are, instead of reacting to the world. Dharana - Dharana (dahr-AHN-uh) is the practice of concentration or complete attention. It’s the ability to focus entirely on a single point — to be completely in the moment. Once you have withdrawn your senses through pratyahara, you can slow down your thoughts and concentrate on a single thing. Athletes often refer to this mental space as being "in the zone." You can practice dharana by bringing your attention to a single sensation, object, or thought. Dhyana - Dhyana (dee-YAHN-uh), you turn your focus entirely inward. This is the practice of deep meditation to attain self-realization. In this second-to-last stage of yoga, you become aware of the flow of all life and existence. Unlike the single-pointed concentration of dharana, dhyana is awareness without a singular focus. Your mind becomes still and your thoughts cease. You simply are. Samadhi - Literally meaning "a putting together," samadhi (sah-MAHD-hee) is supreme bliss; the highest stage of meditation. Also understood as spiritual ecstasy or enlightenment, samadhi is the state in which you transcend your lower self and merge with the universe. You become aware of your connection to all living things, to your higher self, and to the Divine. The freedom, joy, and fulfillment brought forth through samadhi creates peace, internally and in the world. It is the ultimate "goal" of yoga. Newer PostWhat is a Rudraksha Bead?